Great architecture is designed around people. Surroundings Community is a specialist consultancy in human-centred design. In other words, we ensure that buildings and public spaces are made for people. We design, facilitate and run workshops that help people clarify, articulate and realise their ideal environments. We're in the business of starting conversations. Think of us as a bridge between the community and project owners – translating key insights and findings into the perfect brief for architects and designers. Just as any structure benefits from a strong foundation, the same goes for its design process. Great architecture is designed around people; our individual preferences, the way we work and live, our dreams and aspirations. The more we understand people’s experiences and interactions, the stronger the foundation for your project’s success. We’re here to manage the complexities of a large building project – to make everything as simple as possible from the outset. The involvement of many decision-makers, influencers and stakeholders can make the navigation of your project difficult. But thanks to our specialist workshops, we help bring the community together and provide a clear, objective direction for the future. A building should be shaped by the people living in it. That’s why we take the time to listen to people, involve them in the process and understand them. By designing a project around a set of human experiences and rituals, we can ensure it meets the needs of the community. Workshopping benefits everyone. It enables clients and designers to uncover new insights, perspectives, opportunities and inspiration; to accelerate their expertise; and to deepen relationships. And from the community’s perspective, it creates a sense of belonging, connection and involvement with the project. 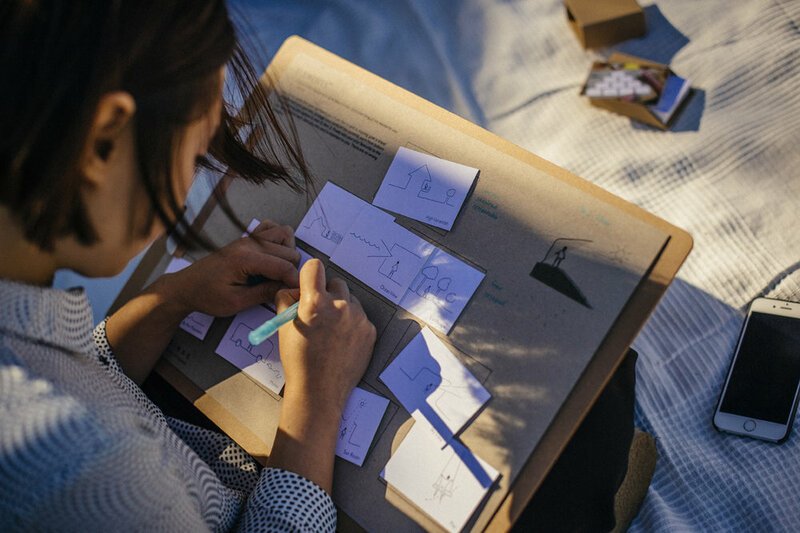 We hosted a workshop for Aesop at their annual strategy day, it was an outdoor session in the gardens at Heide Museum in Melbourne and focussed on amplifying human experience in retail environments. Our workshops inspire stakeholders to discuss ideas, viewpoints and experiences – creating a culture of trust and inclusion between the community, design team and project owners. Over the past ten years, we have been developing a series of exercises and tools that form the basis of our workshops. Today, it’s a structured process, carefully controlled and considered to unearth subconscious thoughts and reflections. It is also relaxed and informal – run as a group workshop environment, rather than a formal meeting. Traditional community consultation involves tabling a concept or idea for support and agreement. We’d rather involve the community at the idea generation phase – so our workshops and surveys happen much earlier. The Surroundings method encourages group alignment through conversation, shared stories and a sense of play. Games and drawings create a sense of play that moves participants into an open, creative mindset. This encourages more intuitive responses, which are closer to the reality of their expectations. We collaborate with the community to explore and generate ideas, which are then processed by the design team into an early project brief. In a workshop setting, we bring clients, designers and the community to a shared table and facilitate a series of exercises to generate ideas that capture the diversity of the community. The interactive exercises are carefully designed to invite self-reflection and guide each individual to share their personal thoughts. Our exercises harness different learning modalities and support each individual, be they a visual, auditory or tactile learner. We trigger a sense of ‘play’ through the use of games and drawing – moving our participants into an open creative mindset, where they respond through intuition as well as thought. This intuitive-creative state often finds our participants learning about themselves and discovering preferences they were unaware they had. Our workshop sees each participant move through each exercise as an individual; this way it can be a true reflection of their unique self. We share at the end of each exercise in a controlled format. The sum of the day is a series of around forty personal insights shared side by side, with each person leaving with the imprint of the group’s collective thoughts. The workshop design excludes any synthesis, patterning or organisation of the insights during the session. This allows us to gather ideas from the community in a convivial way, without promising things that may not be feasible, or asking the community to form agreements which may cause disruption. After each session, there is a debrief with Surroundings, the specialist design team and the client (when available) to capture our ‘response’ on what insights we will take forward and integrate into the concept design. By sharing personal ideas and thoughts, a quick and deep intimacy is formed in the group, as well as a trust in the designers and clients at the table. We liken it to breaking bread together, and this is the reason we cap the numbers at nine for the table. We have found that this deep trust is weakened beyond that number. A designer is present to listen to each person’s deep personal experiences – ensuring that everyone feels truly consulted and heard. By using exercises, open questions and idea generation, we take it beyond the anticipated question and answer format, allowing us to conduct a comprehensive consultation that is not restricted by the design of the questions. By removing the synthesis, group work and need for agreement – and adding a fantasy element to the format – we can harness a wider collection of ideas without committing to specific design outcomes. Not all ideas are implemented, but the process helps to shape and discover best value. These wider ideas deliver innovation opportunities.